Word of mouth marketing has always been the best marketing strategy for any business. The digital world has a new form of word of mouth marketing, and this is in social media marketing. A recent Market Force study shows that over 80% of American shoppers made purchases based on influence and recommendations on social media. Social Media Marketing is cost effective, reaches a wide audience, and delivers quick results. However, if a Social Media Marketing strategy is handled the wrong way, some terrible blunders can occur. Here’s some mistakes to watch out for. It’s cliché, but it still stands true. If you fail to plan, you plan to fail. Not having a Social Media Marketing strategy will result in ad hoc and disjointed posts that may leave your clients, staff, and even yourself confused. This can easily accelerate into disinterest (blocking, unfriending, unfollowing, etc.) and other negative reactions. Build a marketing plan isn’t easy for a novice, so it may be a good idea to seek the advice of social media service providers for guidance. Who you market to on social media, matters. Think about it. If you were to put your adult store on Facebook for advertising purposes, and decided to target a wide demographic that including children aged 12 - 16 (a very large portion of Facebook users! ), do you think you would generate many leads? Unlikely. Instead of focusing on gathering a large following of anyone who will click the “Like” button, work on attracting your true target customers, who are more likely to become raving fans of your brand. Many businesses forget that social media does more than branding and buzz creation. Thus, they pass up numerous opportunities for lead generation. Without a proper lead generation strategy and sales funnel, your social media marketing strategy will be a huge waste of your time and resources. There are so many Social Media platforms out there, and more are coming online every day. Some businesses make the mistake of signing up for every platform they come across. On the face of it, this may seem wise. However, this will take up your valuable time, and exhaust marketing resources so that it’s unlikely any social media platform will create leads. Big mistake. A better strategy would be to choose only a few social media channels that specifically match where your target buyer is likely to be found. Research conducted by Lithium Technologies showed that respondents expected fast response to their social media queries. For instance, 70% of respondents quoted an expected 60-minute response to twitter questions and 41% expected 24-hour feedback to Facebook queries on business days. When it comes to replying to customer queries, if you snooze, you lose. With social media, potential customers and other interested parties may not engage you directly all the time. They might make comments about your company, staff, or products on other unrelated pages. The worst mistake you can make is to ignore this feedback. It’s far better to craft positive responses that educate and entice others to follow you. Those kitten videos are so cute, but what do they have to do with your shoe business? You need to post relevant content to attract meaningful traffic on social media. Create engaging, compelling, and informative content rather than engaging in self-promotion or cliches. You need to maintain a balanced and relevant social media presence. If you hardly ever post, your audience will forget you and your products. If you’re always posting and filling up your followers’ feeds, they’ll get annoyed and block you. When formulating your social media strategy, plan your posts such that you deliver when your audience is sure to notice. There are many different reasons why your audience and the general public would find a post offensive. Sometimes, it simply can’t be helped, as you can’t please everyone. However, to avoid the mistake of offending the majority, proofread, edit, and seek feedback on all content you create before posting it to your social media channels. Black-hat marketers often use spam tactics and link farms to purchase social media account followers and virtual fans. While this may look attractive at first, it’s likely to spiral into a disaster. Such fake spam accounts add no value to your account and all managers should strive to attract a genuine following. Fake followers will hurt your engagement, ruin your rankings, and chase away your real customers. If you’re always talking about yourself - how great you are, and what others can do for you - then you’ve totally missed the point of social media. People log into social media to access interesting, entertaining, and informative content. If you can consistently produce interesting content, then you will attract a loyal following who you can eventually pitch your products. Social media marketing is all about connecting with your followers. If all your posts, updates, or tweets are about selling your products and services, your followers will develop apathy towards you. However, if you are making meaningful and lasting connections, sales will become a profitable by-product of these connections. Don’t overdo it by pitching all your own content, all the time. Sharing is caring. An effective social media marketing campaign requires you to create relationships with your audience, coaxing them to become loyal advocates and customers of your online brand. Mistakes happen, and they’ll be less likely to occur if you’ve been given a heads-up. Over to you. 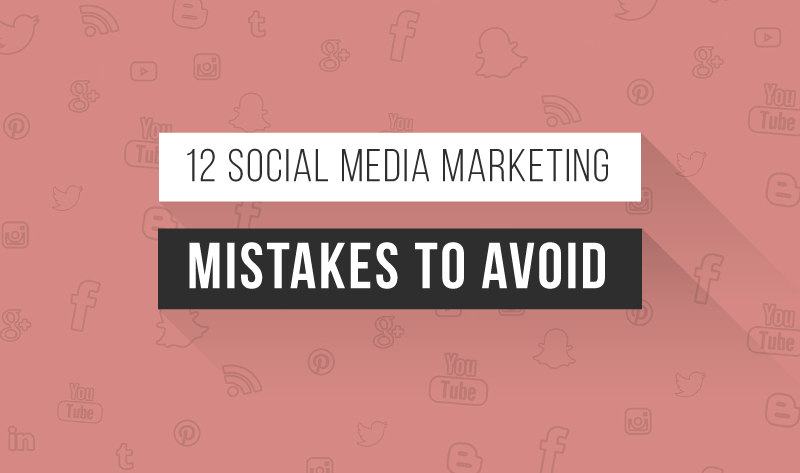 Are there any social media marketing mistakes you’ve made, and have learnings you can share? Leave your comments below and get the discussion started!